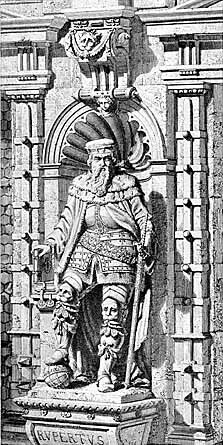 Rupert I, Elector Palatine, established the university when Heidelberg was the capital of the Electoral Palatinate. Consequently, it served as a centre for theologians and law experts from throughout the Holy Roman Empire. Matriculation rates declined with the Thirty Years’ War, and the university did not overcome various fiscal and intellectual crises until the early 19th century. Subsequently, the institution once again became a hub for independent thinkers, and developed into a “stronghold of humanism” and a center of democratic thinking. At this time, Heidelberg served as a role model for the development of postgraduate schools at U.S. universities. However, the university lost many of its dissident professors and was marked an NSDAP (Nazi) university during the Nazi era (between 1933 and 1945). It later underwent an extensive denazification after World War II—Heidelberg serving as one of the main scenes of the left-wing student protests in Germany in the 1970’s. 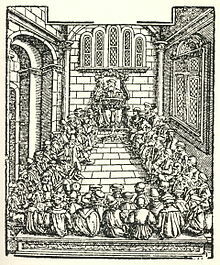 Rupert I recognized the opportunity and initiated talks with the Curia, which ultimately led to a Papal Bull for foundation of a university. After having received on October 23, 1385 the permission from pope Urban VI to create a school of general studies (Latin: studium generale), the final decision to found the university was taken on June 26, 1386 at the behest of Rupert I. As specified in the papal charter, the university was modeled after the University of Paris and included four faculties: philosophy, theology, jurisprudence, and medicine. 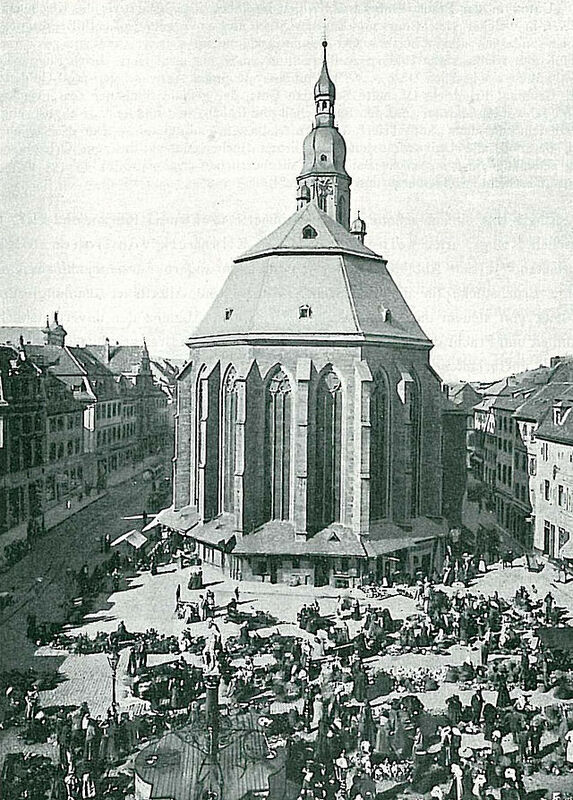 On October 18, 1386, a special Pontifical High Mass was held in the Heiliggeistkirche to establish the university, and on October 19, 1386, the first lecture was given, making Heidelberg the oldest university in what is now Germany. In November 1386, Marsilius of Inghen was elected first rector of the university. The rector’s seal motto was semper apertus (always open). The university grew quickly and in March 1390, 185 students were enrolled at the university. Between 1414 and 1418, theology and jurisprudence professors of the university took part in the Council of Constance and acted as counselors for Louis III, who attended this council as representatives of the emperor and chief magistrate of the realm. This resulted in establishing a good reputation for the university and its faculty. The transition from scholastic to humanistic culture (centerpiece of Renaissance intellectual life) was effected by the chancellor and bishop Johann von Dalberg in the late 15th century. Humanism was represented at Heidelberg University particularly by the founder of the older German Humanistic School Rudolph Agricola, Conrad Celtes, Jakob Wimpfeling, and Johann Reuchlin. Æneas Silvius Piccolomini was chancellor of the university in his capacity as provost of Worms, and became an avid supporter of the university when he becam Pope Pius II. In 1482, Pope Sixtus IV permitted laymen and married men to be appointed to the faculty of medicine through a papal dispensation. Martin Luther’s disputation at Heidelberg in April 1518 made a lasting impact, and his adherents among the masters and scholars soon became leading lights of the Reformation in Southwest Germany. When the Electorate of the Palatinate turned to the Reformed faith, Otto Henry, Elector Palatine, made the university a Calvinist institution. In 1563, the Heidelberg Catechism (still in use today) was created by members of the university’s divinity faculty. Subsequently the university attracted scholars from all over the continent and developed into a cultural and academic center. However, with the beginning of the Thirty Years’ War in 1618, the intellectual and fiscal health of the university declined. In 1622, the then world-famous Bibliotheca Palatina (the library of the university) was stolen from the University Cathedral and taken to Rome. The reconstruction efforts thereafter were stalled by the troops of King Louis XIV, who destroyed Heidelberg in 1693 almost completely. As a consequence of the late Counter-Reformation, the university lost its Protestant character, and was controlled by Jesuits. In 1735, the Old University was constructed at University Square, then known as Domus Wilhelmina. Through the efforts of the Jesuits a preparatory seminary was established, the Seminarium ad Carolum Borromæum, whose pupils were also registered in the university. After the suppression of the Jesuit Order, most of the schools they had controlled passed into the hands of the French Congregation of Lazarists in 1773. They deteriorated from that time forward, and the university itself continued to lose in prestige until the reign of the last elector Charles Theodore, Elector Palatine, who established new chairs for all the faculties, founded scientific institutes such as the Electoral Academy of Science, and transferred the school of political economy from Kaiserslautern to Heidelberg.The financial affairs of the university, its receipts and expenditures, were put in order. At that time, the number of students varied from 300-400; in the jubilee year, 133 matriculated. As a consequence of the disturbances caused by the French Revolution, and particularly because of the Treaty of Lunéville, the university lost all its property on the left bank of the Rhine, so that its complete dissolution was expected. This decline did not stop until 1803, when the university was reestablished as a state-owned institution by Karl Friedrich, Grand Duke of Baden, to whom the part of the Palatinate situated on the right bank of the Rhine was allotted. Since then, the university bears his name together with the name of Ruprecht I. Karl Friedrich divided the university into five faculties and placed himself at its head as rector, as did his successors. During this decade Romanticism flourished in Heidelberg with the appointments of Clemens Brentano, Achim von Arnim, Ludwig Tieck, Joseph Görres, and Joseph von Eichendorff, which led to a revival of interest in Medieval German literature, poetry and art. Germany is, of course famous for its breads, especially rye bread. 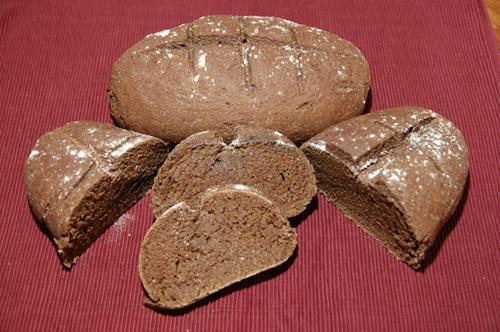 Heidelberg has its own twist on rye bread in that the dough has cocoa in it. It is wonderful for sandwiches, especially if you toast it first. Dissolve the yeast in the warm water. Add molasses, rye flour, cocoa, and caraway seed. Beat until smooth. Add salt and shortening, and then add white flour gradually until the dough does not stick to the bowl. Turn out on to a floured board and let rest for 10 minutes. Then knead until smooth and elastic. Place the dough in greased bowl and let it rise until doubled in volume. When pressed with a finger it should spring back within a few seconds, but not too fast. Punch the dough down and let it rise again in the same way. Shape the dough into 2 oblong loaves, gently rolling it back and forth to taper the ends slightly. Place the dough on a greased baking sheet sprinkled with cornmeal. When the dough begins to rise slash the top with a very sharp knife. When almost doubled, bake the loaves at 375°F beside a small pan of water for 35 to 40 minutes. Gently simmer 1 tablespoon of cornstarch in 1 cup of water until the mixture turns clear. After 15 minutes, brush the loaves with this glaze. Brush again 10 minutes before removing from oven and again when it is taken from the oven.